How Catholic Was Clinton's Speech? 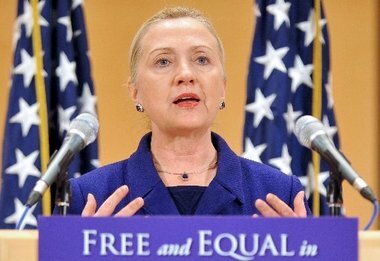 Secretary of State Hilary Rodham Clinton’s speech in defense of LGBT rights as human rights should be required reading for Vatican leaders, who have been shamefully silent on abuses against LGBT people around the world. The philosophical basis of Clinton’s speech is the same basis for Catholic teaching on human rights: the inherent dignity of every individual. As polls continue to show that U.S. Catholics are way ahead of their bishops on LGBT equality, members of the hierarchy in this country are already behind the curve. On the international scene, Catholic leaders could still play a pivotal role in protecting human rights for LGBT people. Catholic leaders need to examine what effect their silence is having on the lives of people. If we want our Catholic church to respect the dignity of LGBT people, we must embody that change in our own lives. https://www.newwaysministry.org/wp-content/uploads/2017/09/logo_nwm-1.png 0 0 Francis DeBernardo, Editor https://www.newwaysministry.org/wp-content/uploads/2017/09/logo_nwm-1.png Francis DeBernardo, Editor2011-12-06 16:42:492011-12-06 16:42:49How Catholic Was Clinton's Speech?